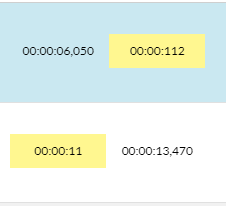 Through editing you can correct mistakes, adjust the timestamps as well as add ‘speakers’. Automatic detection of spoken word can result in mistakes, either through mispronunciation, accents or otherwise. Checking for and editing mistakes is therefor an important step in creating captions. Timestamps are also created automatically, timestamps govern when a caption appears. Sometimes due to background noise or music in a video a caption can appear too early or too late. Checking and adjusting caption timestamps will therefor perfect the timing of each caption. By adding ‘speakers’ a conversation between two or more people will be more clear to the reader as it will add the name of who said what in front of a sentence which can be important for the forming of context. Firstly you can see the system at work. Secondly you can already take note of any discrepancies made. Simply press play in the miniature preview to the right of the list of captions. To edit a caption simply press on the text of the caption you wish to edit. This will pause the video if it was playing and track towards the starting moment of that specific caption. Adjust the text to correspond with the spoken word. Click anywhere else on screen to escape the editor for that caption. Check the timing of the caption. When the timing is off simply click on one of the timestamps to the left of the captions to either adjust the starting or end point. The time format is ’00:01:54,840′. Or: Hours, Minutes, Seconds, Milliseconds. Sometimes this will be displayed as HH:MM:SS,fff. Entering milliseconds is not required! When you cross the timing of another timestamp this will be noticeable by the fact that both the timestamp you just adjusted as the one it crossed will appear in yellow (as shown below). You will have to decide which of both needs adjusting to fit the spoken word best. When you have multiple speakers in a video you can mark those passages spoken by him/her by checking the checkbox in front of the timestamps and the caption itself (see example below). You can select as many check-boxes you want to add a speaker to all those captions in bulk. When you have selected one or more captions to add a speaker to simply enter his/her name or a description of his/her title/job/etc. and press add. The chosen name for the speaker has now been added in front of the caption text (in brackets, see below). You can of course also manually add the speaker name to a caption by simply typing [name] in front of the caption but when you need to do multiple fields it is always faster to do it as described above. Once you are done with all the required edits simply press save on top of the edit screen or if you like to start over, press revert.